"I'm just glad my cat's alive." Twenty-six-year-old Kristen Eliasson was sound asleep in her one-bedroom apartment on Somerset Street in Ottawa on the morning of August 16th when the building went up in flames. She did not hear either the sirens emanating from the fire trucks and emergency personnel outside in the street or the alarm bell ringing in the hall. Worst still, the smoke detector in her flat was on the fritz. Fortunately for her, about four months ago she had taken in from the street a black and white cat named Bacon who cruelly had been left to fend for himself when his callous owners had relocated elsewhere. Being both a light sleeper and a quick study as all cats are, Bacon immediately knew what was happening. Without a minute to spare, he jumped in bed with Kristen and began loudly meowing in her face until she finally woke up. By that time, thick black smoke was billowing into the apartment and it was getting difficult for both Bacon and her to breathe. The fire not only completely destroyed her building but an adjacent one as well. All totaled, thirty-one people were left homeless by the fire. Some cynics maintain that no good deed ever goes unpunished and while that sort of misanthropic thinking may have some small measure of currency in human affairs, it is totally spurious when it comes to animals. They do not play by those rules. "A cat has absolute emotional honesty," Ernest Hemingway once commented. "Human beings, for one reason or another, may hide their feelings, but a cat does not." The particulars of this story are unique to Kristen and Bacon, but the phenomenon of rescued cats and dogs returning the favor by saving the lives of their guardians is fairly common. It is almost as if they take it upon themselves to become their rescuers' guardian angels for life. "If the letter writer has taken these cats, then he or she is guilty of theft. Anyone who helped has aided and abetted an offender in committing the crime." 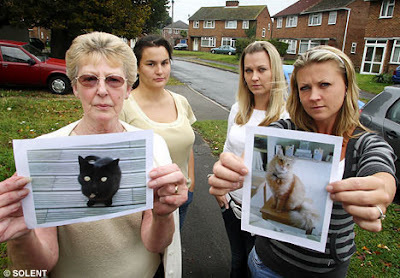 A bird lover has claimed responsibility for trapping and abducting six out of eight cats that have disappeared during the past six weeks from Bramley Crescent in the Sholing district of Southampton. The fate of the other two cats is unknown. 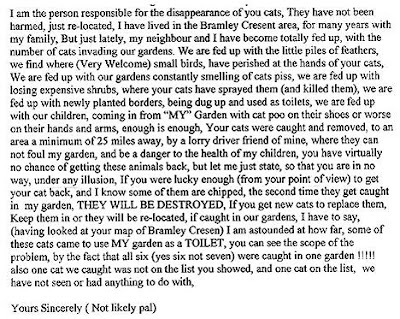 In an anonymous letter sent to the Southern Daily Echo, the architect of the crimes states that the cats were trapped in his or her yard and driven a minimum of twenty-five miles away by a friend with a truck. Although the author maintains that the felines were not harmed, the letter does not give any indication of what was done with them. They could have been dumped, handed over to a shelter to kill, or sold to either fur traffickers or vivisectors. As to the motivation behind the abductions, the writer blames the cats for killing birds, destroying shrubs, and fouling gardens with urine and feces. Furthermore, the perpetrator threatens to kill any felines that venture into his or her yard in the future. The letter was most likely in response to a massive publicity campaign mounted by the aggrieved cat owners that has included handing out leaflets in the neighborhood and putting up posters on lampposts. Malheureusement, about the only hope that the owners have of getting their cats back rests with shelters. Should they be picked up by animal control, perhaps someone at a shelter might either recognize them or be diligent enough to scan the animals for hidden microchips. The fact that none of that has occurred so far indicates that the cats are most likely either already dead or being held somewhere against their will. "If the letter writer has taken these cats, then he or she is guilty of theft," Inspector Andrew Timms of the Hampshire Constabulary told the BBC on October 19th. (See "Catnapper Fear After Pets Vanish.") "Anyone who helped has aided and abetted an offender in committing the crime." The letter therefore could be a hoax or a clumsy attempt to lead cat owners and the police on a wild goose chase. On the other hand, bird lovers are such egomaniacs and psychopaths that they cannot help but boast about their cleverness and evil deeds. The epistle therefore could be legitimate but with the pertinent details altered so as to throw off suspicion. Par exemple, although the writer claims to have lived in Bramley Crescent for many years, he or she misspells Crescent. For what it is worth, the catnapper also admits to living quite a distance away from the cat owners and to having children and a garden. Presumably, he or she does not own a cat. Furthermore, the perpetrator also would have needed to purchase some type of bait, most likely commercial cat food made from fish, and anyone making such a purchase might be remembered at a neighborhood emporium, especially if he or she was not a regular buyer of cat food. The police therefore have quite a few leads to track down and should be able to make an arrest in the case if the details contained in the letter are remotely accurate. "Whoever has done this is cruel, selfish, and horrible," she added. "Why would anyone take a cat?" Sadly, she is dead wrong about that. The abductor knows only too well how much cat owners dote on their companions and no doubt relishes in inflicting as much pain as is possible. Marian Parker, who has been robbed of her cat, Puss Puss, certainly knows the score. "It is very sad and very distressing," she told the Daily Mail. "Whoever is doing this is very cruel." An elderly resident, who chose to remain anonymous, told the Daily Mail that she fears that her ailing cat is already dead because it has been deprived of its kidney medication since its abduction. "It's disgraceful. I'm absolutely appalled. It's cruel and sick. This letter is very threatening and frightening," she said. The law should treat the abduction and harming of cats the same way that it treats the kidnapping and murder of children and adults. 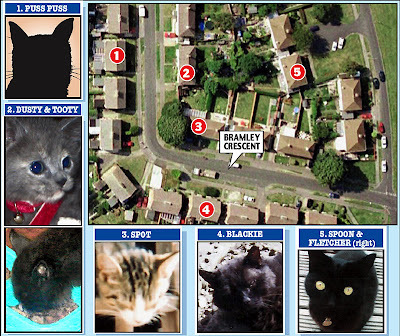 An inveterate hatred of cats and a penchant for violence are the true motivating factors behind the crimes committed in Bramley Crescent; bird advocacy is merely the mantle that the perpetrator is hiding behind in order to mask his or her true intentions. Instead of stealing the cats, the abductor could have fenced in his or her property and that would have solved the problem. If he or she was too cheap to have gone that route, nonlethal repellents such as water pistols, horns, and predator urine could have been employed. The sprinkling of cayenne pepper, ground-up grapefruit and lemon rinds around the yard as well as the planting of rose bushes and rue are also known to deter cats. 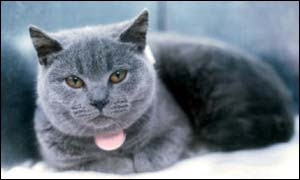 The perpetrator also could have posted signs on his or her property warning cat owners to keep their animals at home. Furthermore, he or she could have leafleted the neighborhood or brought the matter to the attention of either the police or block association. The fact that the letter writer chose not to pursue any of these rational and legal options proves conclusively that he or she was motivated solely by an inveterate hatred of cats. Moreover, voles, moles, squirrels, dogs, and other animals also dig up flower beds as well as urinate and defecate in gardens and yet homeowners do not go after any of them with malice aforethought. Juveniles also damage yards and shoot birds with slingshots and yet no bird lover would be so brazen as to harm a child. More to the point, no animal does as much urinating and defecating in yards as birds. Worst still, they defecate on automobiles, lawn furniture, swing sets, children's toys, and on people's heads. Birds also are known to spread deadly diseases, such as the West Nile Virus and Vogelgrippe. On balance, feline excrement is considerably safer and less pervasive than avian waste products. Based upon the tortured logic that bird lovers wallow in, individuals who do not like birds would be fully justified in killing all of them that fly into their yards. It is also important to remember that birds also kill kittens, cats, small mammals, insects, and other birds. As for cat owners, they must take precautions in order to ensure the safety of their beloved companions. Fencing in their yards and accustoming their cats to walk on leashes are both ideas worth exploring. Above all, they must remain vigilant at all times. The long-term solution is to segregate cat owners and bird lovers in different sections of town. In the meantime, however, bird lovers who commit acts of violence must be apprehended and punished severely. Photos: Daily Mail (Went and other cat owners, diagram, letter, and Fletcher) and BBC (Dusty and Tooty). "I don't think this is uncommon in the rural community. That doesn't make it right, Mr. Hunt." It is business as usual for cat killers and their protectors within Virginia's legal and political establishments. Plus ca change, plus c'est la meme chose. 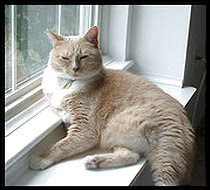 The latest feline mass murderer to receive the state's imprimatur is fifty-five-year-old Donald Hunt, a farmer from the unincorporated city of Norge in James City County on Virginia's peninsula and near Hampton Roads. As proprietor of a four-hundred-acre spread known as Hill Pleasant Farm on Richmond Road, he trapped and drowned at least five feral cats in a backyard pond sometime between the tenth and thirteenth of August. For these despicable crimes he was sentenced on October 11th to a measly one month in jail, fined $500, and ordered to perform one-hundred hours of community service. Although he pleaded nolo contendere at trial, Hunt has announced plans to appeal the verdict and therefore remains free on bail. More than likely he will be able to use his money and political connections in order to get out of spending either a day in jail or parting with any of his precious shekels. The case began when Williamsburg-James City County Animal Control lent him humane traps with the stipulation that he was to turn over any cats that he trapped to the Heritage Humane Society. Later, animal control received a tip from their colleagues at New Kent County Animal Control that Hunt had drowned several cats on his property. When confronted with this accusation he readily admitted to having drowned five cats. Actually, the toll may have been much higher in that it is estimated that between seventeen and twenty cats were living on his farm at the time of the killings. Press reports are conspicuously silent as to the welfare of the remaining cats and it is not even clear if this topic was broached at trial. The law enforcement community's failure to fully investigate this case is inexcusable. The killings could very well still be continuing at this moment. It was clear that the fix was in when prosecuting attorney Nate Green allowed Hunt to plead no contest to only one count of animal cruelty and dismissed the other four counts against him. Since killing a cat is regarded as only a class one misdemeanor in Virginia, Green's generous offer practically guaranteed with Hunt would walk. It would be interesting to know if Norment, who is also a state senator from Williamsburg, would make a similar distinction between rural and urban homicides and between murders of the poor as opposed to the rich. Most likely he would be willing to go along with almost anything so long as there was a buck in it for him. From that inauspicious beginning, he went on to claim that the cats were ruining Hunt's business although the Daily Press does not indicate that he provided the court with a shred of evidence in order to back up his allegation. Normally, cats are a welcome addition on farms because they help to keep the rodent and snake populations in check and for Norment to allege otherwise strongly suggests that his client's criminal behavior was motivated solely by an inveterate hatred of cats. Unfortunately, neither logic nor morality have ever made much of a dent in the thick craniums of politicians and shysters of Norment's ilk. "Mr. Hunt disposed of the cats -- at least in his perspective -- in a humane way," he somehow managed to tell the court with a straight face. To her credit, General District Court Judge Colleen Killilea rejected Norment's sophistry. "I don't think this is uncommon in the rural community," she said. "That doesn't make it right, Mr. Hunt." Sadly, that is about all that can be said positively about her abysmal conduct on the bench. First of all, she should never have accepted the sham plea bargain agreement negotiated by Norment and Green. Secondly, since she admits to being cognizant of the fact that feral cats are routinely killed in rural Virginia, she should have made an example of Hunt by putting him behind bars for a very long time. Finally, her most grievous error was in failing to order both prosecutors and law enforcement officials to conduct a thorough investigation into the welfare of the cats remaining within the boundaries of Hill Pleasant Farm. Specifically, all ponds and lakes on the property should have been drained in a search for additional feline corpses. The disgraceful performances of Green and Killilea were matched by the tepid reactions to the killings that came from so-called animal rights groups and advocates. The first to flap her yak was Kristin DeJournett of the phony-baloney People for the Ethical Treatment of Animals (PETA) who combined her criticism of Hunt's light sentence with a plea that the killer not be allowed to satisfy his community service requirement at an animal shelter. PETA's constraint is fully understandable in light of the fact that it is arguably the nation's number one killer of cats and dogs. 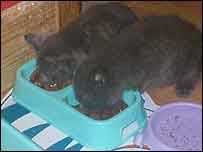 For instance, its Norfolk shelter admits to killing in excess of eighty-six per cent of all animals that it impounds. Consequently, PETA's killing factory in Norfolk would be an ideal location for Hunt to fulfill his community service obligation. More to the point, PETA hates feral cats with a vengeance and repeatedly proclaims to the world that they do not have any right to live! Given the opportunity, it would have made quicker work of the cats at Hill Pleasant Farm than Hunt. 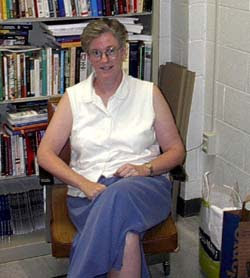 By limiting her critique of the verdict to putting in a good word for TNR and rabies vaccinations, Katherine Rahman, a volunteer with the Heritage Humane Society and a professor of political science at the College of William and Mary, demonstrated that she would make a far better tap dancer than an animal rights proponent. (See photo above.) First of all, neither her organization nor Williamsburg-James City County Animal Control should be passive participants when it comes to the care and protection of feral cats. Au contraire, both groups should do their own trapping instead of lending traps to monsters like Hunt and then looking the other way. Most importantly, both organizations should recognize the right of all cats to live by implementing a strict no-kill policy. "Drowning's just a terrible way to die, and it's not going to solve Mr. Hunt's problem," Professor Rahman told the Daily Press in the article cited supra. It is too bad that she does not realize that her organization's negligence and extermination policies are also incapable of solving the problem as well as being morally reprehensible. The Daily Press generously gave the last word to Lindsay Potts of the Virginia Farm Bureau who immediately took advantage of the opportunity to libel cats with getting into feed supplies and spreading diseases to other animals. This is in spite of the well established fact that the domestication of cats and the advent of the growing of wheat, barley, and other grains occurred almost simultaneously. The claim that cats spread diseases to livestock is equally ludicrous in that cats have lived on farms for thousands of years without doing anything of the kind. If disease has become a problem, the more likely culprits are livestock whose immune systems have been compromised through genetic engineering, the wide scale use of contaminated commercial feed, growth hormones, and antibiotics, as well as unhygienic conditions created by housing too many animals in too small of an area. Whenever it comes to killing cats, however, almost any lie or excuse will suffice. It is well known that animal control officers, veterinarians, and shelters exterminate somewhere around ten-million cats each year in the United States. Nobody, however, is willing to hazard a guess as to the number of cats and kittens that are systematically exterminated by private individuals on farms and in city apartments. The worst thing about this deplorable situation is that it is simply accepted by society. James Hunt and Virginia are not aberrations. 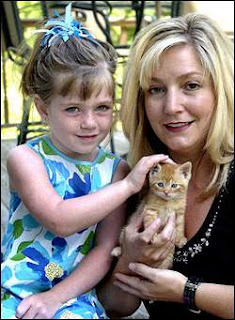 On June 1, 2006, Christine Hill of Brookfield, Massachusetts rescued a tiny kitten subsequently named Lucky Girl from the clutches of Laurence E. Thayer who was attempting to drown her in a bucket of water. Outrageously, the police refused to even prosecute Thayer because he is a sewer commissioner. "He dealt with the problem the best he could. Back in their day, that's what they did," Police Chief Aram Thomasian Jr. said at the time. The systematic killing of cats and kittens en masse by private individuals is so widespread and has been going on for so long that feline aficionado Helen M. Winslow even had the temerity to admit to "disposing" of dozens of kittens in her 1900 book entitled Concerning Cats. The protagonist in Daniel Defoe's 1719 fictional masterpiece Robinson Crusoe was also guilty of the same offense. Moreover, if the reactions of officials in Virginia and Massachusetts are indicative of sentiments elsewhere, eradicating this odious practice is going to be extremely difficult. The effort must be made nonetheless. Virginia claims to be the state for lovers but when it comes to cats, both feral and domestic, it is heartless, brutal, and uncivilized. The message from its redneck judges and politicians is clear: individuals who drown feral cats, shoot and stomp to death domestic cats, and hoard cats by the hundreds have nothing to fear from us. The good old boy network of privilege and connections is alive and well as is the love of a fast and easy buck. The fact that untold numbers of defenseless cats are sacrificed upon the altars of expediency and callousness does not weigh heavily upon the collective conscience of Virginians. On the contrary, their warped souls enjoy a repose usually reserved for either the dead or the inebriated. Photos: Daily Press (Hunt), State of Virginia (Norment), College of William and Mary (Rahman), Dan Gould of the Worcester Telegram (Lucky Girl and her family), and Brent Cornell (Luke). "The results of our study clearly indicate that exposure to environmental factors such as secondhand tobacco smoke has devastating consequences for cats because it significantly increases the likelihood of contracting lymphoma." The evidence continues to accumulate that many selfish and uncaring individuals are deliberately killing their cats, dogs, birds, and infants by insisting upon smoking in their presence. Furthermore, smokers appear to be using restrictions on smoking in public as an excuse to light up more often at home. A study conducted on one-hundred-eighty cats treated at Tufts Veterinary School between 1993 and 2000 found that those living in homes with smokers were twice as likely to contract feline lymphoma as opposed to those residing in non-smoking environments. The more smokers in the home, the greater the volume of cigarettes consumed, and the longer that cats are exposed to environmental smoke all combine to dramatically increase their chances of dying from cancer. The study, "Environmental Tobacco Smoke and Risk of Malignant Lymphoma in Cats," was conducted by Antony S. Moore and Laura N. Snyder of Tufts with the assistance of Elizabeth R. Bertone of the University of Massachusetts at Amherst and was published in volume 156 of the American Journal of Epidemiology on August 1, 2002. Feline lymphoma, the most common form of cancer in cats, attacks the lymph nodes and intestinal tracts of felines that are usually around ten years of age. The disease is treated with chemotherapy and radiation for a period of approximately six months and at a cost of between $2,000 and $3,000. With treatment, only sixty-five per cent of those afflicted go into remission and only twenty-five per cent survive for longer than two years. With such a dismal prognosis it is doubtful that many cat owners are willing to pony up the exorbitant fees demanded by veterinarians. 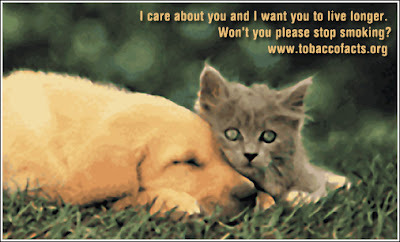 One reason that cats are so susceptible to the dangers of cigarette smoke is that they have such small lungs. An even more telling reason relates to the huge amount of carcinogens that settle in their fur and are therefore ingested when they groom themselves. In particular, their grooming habits expose the mucous membranes in their mouths to cancer-causing carcinogens. To be more specific, this study of one-hundred-thirty-four dogs concluded that the incidence of lung cancer was even higher for canines with short and medium-sized noses (pugs, poodles, etc.). This is because their short nasal passages fail to intercept most carcinogens before they reach their lungs. Although she does not cite any specific studies in order to back up her allegations, MacAllister nonetheless does note in passing that secondhand smoke causes pneumonia and lung cancer in pet birds kept in the home. 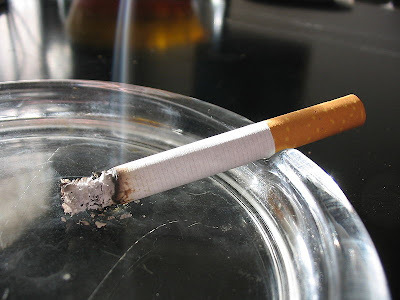 Because their diminutive organs soak up a disproportionate amount of secondhand smoke they are prone to eye, skin, heart, and fertility problems. Dogs and birds also have been known to die from nicotine poisoning. Jill Richardson, a veterinarian with the ASPCA's Animal Poison Control Center, cites excitation, salivation, panting, vomiting, and diarrhea as the early warning signs that a pet has swallowed tobacco. The signs of advanced nicotine poisoning include muscle weakness, twitching, depression, collapse, coma, a racing heart, and cardiac arrest. Back in 2002, Bertone said, "We believe that feline exposure patterns to environmental tobacco smoke may mimic those of young children living in households where adults smoke and where the children inhale tobacco smoke or ingest particulate matter by mouthing contaminated objects." Recent research conducted by Bristol University has substantiated her fears. Writing in the journal Early Human Development, the researchers state that an astounding eighty-six per cent of all victims of Sudden Infant Death Syndrome (SIDS) are born to mothers who smoked during pregnancy. Furthermore, the risk of dying from SIDS continues to increase if mothers keep on smoking in the presence of their newborns. "The risk of death increased with each individual hour the baby was exposed to smoke," lead author Peter Fleming told the BBC on October 15th. (See " 'Clear Smoking Link' to Cot Death.") "For example, a baby exposed to smoke eight hours a day was eight times more likely to die from SIDS than a baby that was never exposed. These are startling statistics." Not only does passive smoking kill companion animals and infants, but it also kills adults. It is difficult to gauge and the statistics keep changing but perhaps as many as fifty-thousand American adults die each year from heart disease, lung cancer, respiratory ailments, and breast cancer caused by secondhand smoke. Despite the existence of a multitude of laws that restrict smoking in public, they are seldom enforced. For instance, individuals continue to smoke with impunity on train platforms, on the loading docks at bus stations, inside casinos, bars, and restaurants, and even outside the entrances to public buildings. Consequently, people using these facilities are not only forced to inhale carcinogens but the pollutants settle into their clothing and hair as well. Health care expenses for individuals suffering from smoking-related diseases run into the tens of billions of dollars each year in the United States. 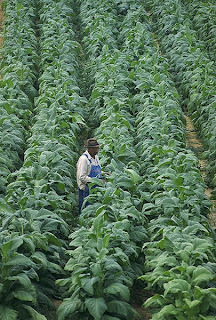 While it is true that these costs are offset somewhat by taxes levied on tobacco products and the jobs generated by the industry, there can be no denying that tobacco is a major killer of both humans and animals. Moreover, it is hypocritical for governments to fatten their tax coffers off of the vices of their citizens whether it be from tobacco, rotgut booze, gambling, prostitution, or the sale of unhealthy foods. Corrupting the masses, however, is an old game. American colonialists used alcohol in order to weaken and subdue Native Americans just as the English plied the Chinese with opium and white South Africans ruined the health of their black vineyard workers by insisting upon paying them in wine as opposed to cash. In more recent times, Hollywood, Madison Avenue, radio stations, television networks, and the universities have championed drug and alcohol abuse as well as sexual irresponsibility in addition to smoking. The dangers inherent in tobacco smoking are not anything new. As early as the 1930s the Germans were placing restrictions on smoking in the workplace and elsewhere. (See Robert N. Proctor's 2000 book entitled "The Nazi War on Cancer.") Furthermore, even before the Surgeon General released his damning report on smoking in 1964 many of the health hazards associated with this disgustingly filthy habit were already well known. Most prominently, smokers are prone to shortness of breath and coughing spasms. Smoking also stains the fingers and yellows the teeth. Careless smoking additionally sometimes leads to house and auto fires as well as ruined sofas and tables. "Our findings offer another reason for smokers living with pets and children to try to 'kick the habit'," Bertone told Science Daily in the article cited supra. "Quitting smoking will not only reduce their risk of cancer, heart disease, and diabetes, but may reduce the risk of cancer in their children and pets as well." With that being the case, the responsibility for protecting the lives of cats, dogs, birds, and infants falls by default to legislators. While banning the growing, manufacture, importation, and sale of tobacco products probably is not politically feasible, public smoking bans should be strenuously enforced. While it would be a colossal tragedy if America were ever perverted into the type of police state that Tony Blair and his cronies have foisted upon the English public, San Francisco's prohibition on smoking in public parks and Los Angeles' ban on puffing on beaches and piers are ideas worthy of emulation. More to the point, individuals who insist upon endangering the lives of animals and children by smoking in their presence should be prosecuted. The fact that this deadly conduct occurs in homes and automobiles is of no legal consequence. Child and animal abuse are both punishable under existing laws regardless of the venue and the same rationale should be applied to smoking. Photos: Thomas Sienicki of Wikipedia (burning cigarette), BBC (cat), Ken Hammond of the USDA (tobacco patch), and Tobacco Facts (anti-smoking ad). "We were really shocked by the result of the e-mails. I am just glad that we were able to get some help." The homeless orange tabby had wandered around the grounds of the D Sands Condominium Motel in Lincoln City, Oregon for months without anyone lifting so much as finger to help him. (See photo below.) All of that changed in August when out-of-towners Jennifer and Peter Spathis registered at the motel. The Spathises contacted a local veterinarian and attempted unsuccessfully to trap Marmalade. When their vacation time elapsed on August 31st they reluctantly returned home to Michigan without having been able to relieve the cat's plight. Although half a continent away, they could not get the sickly cat out of their minds. Jennifer therefore decided to send out thirty-two e-mail letters to animal rescue groups in the Lincoln City area soliciting help for Marmalade. Her plaintive entreaties were finally answered by Barbara Jones of Pacific City Angel Arms (PCAA) and Evan Kalik of the Cat Adoption Team from Sherwood. With the assistance of the motel, PCAA was finally able to trap Marmalade on September 23rd. The cat spent two nights at PCAA before he was transferred to PAWS Animal Shelter in West Linn where on September 25th he underwent successful surgery. According to an October 16th e-mail from PAWS' Sharon Murphy, Marmalade is still recuperating from his surgery and it will be a few more days before anything definitive is known about his prognosis. PAWS and the Cat Adoption Team have agreed to split his estimated $1,000 medical bill. A bake goods sale sponsored by PAWS recently raised $192 toward this goal and donations are being accepted at (503) 650-0855. "Any time I save a life is great," Kalik told the News-Times of Newport on October 3rd. 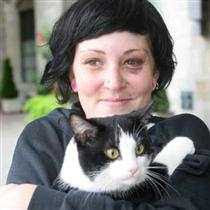 (See "Feral Cat's Grave Condition Turned Around with Help of Lincoln City Hotel Guest, Pet Groups.") "You save a life, you save the world. We save a life everyday here." The fact that it unfortunately took a tourist to procure help for the long-suffering cat disturbs Murphy, however. "I think the amazing thing is he was in terrible shape for months and everyone commented on him, but it took one person sending out an e-mail to take care of the problem," she told the News-Times. The motel's failure to act was likely due to more than just callousness. Veterinary costs are every bit as ridiculous as medical care for humans and few individuals are either willing or able to pony up several hundred dollars in order to save the life of a feral or stray cat. Clearly, drastic measures need to be taken to ensure than both companion animals and individuals receive the medical attention that they need and deserve regardless of whether they can afford it or not. The entire situation is a disgrace all the way around. All politicians should be kicked out of office for doing the bidding of the pharmaceutical manufacturers and insurance companies as opposed to addressing the legitimate needs of both individuals and animals. As for kindhearted Jennifer, she told the News-Times, "We were really shocked by the result of the e-mails. I am just glad that we were able to get some help." In the 1946 movie It's a Wonderful Life, Jimmy Stewart, in the role of hard luck George Bailey, demonstrated that no one should ever discount the impact that one caring individual can have on society. Moreover, without people like the Spathises, PAWS, the Cat Adoption Team, and PCAA this society would be unbearable. 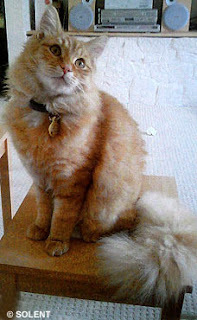 Murphy describes Marmalade as more of a fraidy cat as opposed to a feral. He enjoys having his fur brushed but is wary of people and accordingly will have to undergo a certain amount of socialization before he can be adopted. 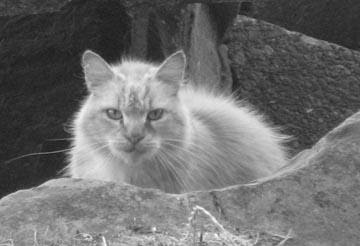 Contrary to the malicious lies spread by ailurophobes and conventional shelters, feral cats can be socialized to varying degrees depending upon their backgrounds and the amount of time that individuals are willing to spend working with them. In the unlikely event that a loving home cannot be found for such a fine looking and brave cat, Murphy has pledged to secure a place for him in either a heated barn in West Linn or at another nearby location. 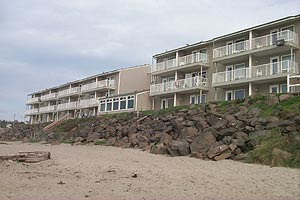 Photos: News-Times (Marmalade) and Beach Connection (D Sands Condominium Motel). "We like them. And all our staff decided to keep up this tradition: to have the cats, and to like them." Vilified, abused, and slaughtered by bird lovers, wildlife proponents, and ailurophobes of all genres, cats have been the most persecuted animals throughout history. This is in spite of the fact that without their unmatched prowess for keeping the rodent population in check the human race may very well have succumbed to famine and disease a long time ago. All in not lost, however, in that there is at least one place on this earth where cats are appreciated not only for their invaluable service to mankind but also for themselves and that is at the world renown Hermitage Museum in St. Petersburg. 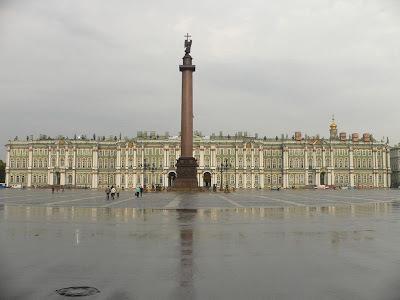 Rounded up in Kazan in 1745 on the orders of Peter the Great's daughter, Empress Elizabeth, they were first installed at her court in Moscow and later at the Winter Palace in St. Petersburg. By the time Catherine the Great started acquiring the Hermitage's unparalleled art collection in 1764 there were already a substantial number of the felines working as mousers at the Winter Palace. They survived Napoleon's invasion and the Bolshevik Revolution of 1917 but they perished like millions of Russians and Germans during the siege of St. Petersburg between 1941 and 1944. 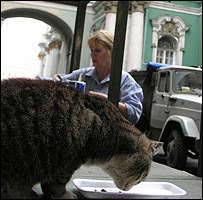 A new group of felines was recruited after the war and about fifty of their offspring still live at the Hermitage. They are fed a daily diet of cereal and milk and are cared for by two full-time employees of the museum. (See photo above.) Their upkeep is financed through voluntary contributions from employees of the museum and a yearly art benefit which raises money for the museum's Cat Fund. A veterinary unit is maintained in the basement where all newcomers are vaccinated and most of them are sterilized. A few of them are allowed to reproduce so as to ensure that the museum will always have resident felines. Weather permitting, they are allowed to roam the gardens and courtyards and warning signs have been erected just in case they should venture out into traffic. They are allowed to wait out the long, cruel Russian winters indoors although they are excluded from the galleries. "We like them," is how she explained the museum's decision to keep the cats to the BBC on October 5th. (See "Hermitage Palace is Cat's Whiskers.") "All our staff decided to keep up this tradition: to have cats, and to like them." Besides, cats are far more than mousers. They provide their caretakers with companionship, love, and amusement. They also help to relieve stress by teaching individuals how to relax. Housed in six buildings including the Winter Place, the Hermitage is home to more than three million works of art. (See photo below of Winter Palace.) It also boasts the world's largest collection of paintings in spite of the fact that during Stalin's reign more than two-thousand priceless masterpieces were ordered to be sold. The museum also contains its share of loot. In particular, it houses a substantial portion of ancient Troy's gold which the Russians stole from museums in Berlin in 1945. They also made off with seventy-four prized paintings by Impressionists and Post-Impressionists that they took from the private collections of German businessmen. Of course, the Germans also did their share of looting when they invaded Russia. The museum, which operates miniature versions of itself in London, Amsterdam, and Las Vegas, is known to cinephiles from the 1995 James Bond movie Golden Eye and the 1977 screen adaptation of Tolstoy's Anna Karenina. The cats are the real attraction, however. It is possible that the museum might have made it through the centuries without them but it would never have flourished with an uncontrolled rodent population damaging the art works and spreading disease. The curators therefore are to be saluted for having the bon sens to recognize that the cats belong at the Hermitage every bit as much as do the works of da Vinci, van Gogh, Gauguin, Picasso, and other great artists. 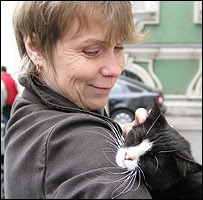 Photos: BBC (cat eating and Khaltunen), and Nagyman of Wikipedia (Winter Palace). "We must connect their (European Wildcats) habitats once again; only then do they stand a chance of surviving." In particular, the plan calls for the setting aside of a total of 20,000 kilometers of forested and shrub-covered land which will in turn be converted into fifty-meter-wide wildlife corridors. Without these passageways, scientists fear that between sixty and seventy per cent of Deutschland's native species will disappear. The first such corridor is to be built between Hainich National Park, where many of the wildcats now live, and the Thuringian Forest in the eastern state of Thuringia. (See map below.) So far, the rights to all but 1,200 meters of this twenty kilometer stretch have been obtained; the remaining tracts of land must still be secured from farmers. In order to facilitate matters, thousands of trees will be planted south of Hainich beginning early next month and construction of the A4 Autobahn is being rerouted north of the Hoersel Mountains, which lie between the two reserves. If needed, animal underpasses also will be constructed beneath existing roadways. The scheme, however, faces several daunting obstacles. First of all, conservation officials must work out arrangements with farmers and other private landowners before they can build these corridors. Secondly, being a federal republic, conservation matters are largely left to the discretion of Deutschland's sixteen states. More importantly, it is not known with any certainty that the animals will even use these safe passages once they are built. 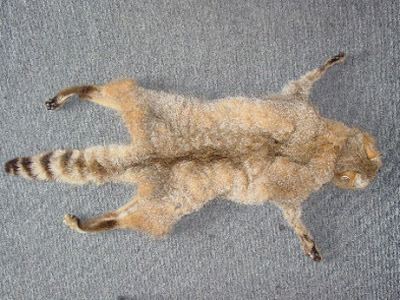 European Wildcats and other animals are under attack in Deutschland from the usual list of suspects and activities that are making life unsustainable for animals everywhere in the modern world. First and foremost is habitat diminution, fragmentation, and destruction caused by commercial and residential development. Road construction and farming activities also carve up habitats and make it almost impossible for animals to migrate. Not only do many animals wind up underneath the wheels of predatory motorists, but isolation leads to inbreeding which further diminishes their available gene pool and ultimately leads to their demise. Farmers and gamekeepers more often than not view wild animals as a nuisance and therefore attempt to eradicate them. On that point, there is not any difference of opinion with officials in Berlin. 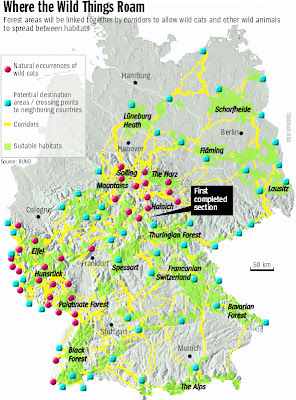 The "dissection of the landscape has become one of the most significant and consistently effective causes of the endangerment of biological diversity in Central Europe," scientists from Bundesamt fur Naturschutz (BfN) recently stated in an environmental journal. Felis silvestris silvestris is in especially bad shape with only an estimated three-thousand to five-thousand of the cats remaining in Deutschland. Not only do they require large habitats in order to secure suitable mates, but they need quiet forests with plenty of dead wood and brush for hunting and camouflage. European Wildcats, which are slightly larger than domestic cats, are usually either gray or brown in color which helps them to blend into their environment. They subsist on a diet of rodents, rabbits, and birds and mate once a year usually in either February or March. After a gestation period of between sixty-three and sixty-eight days, two to four kittens are born in May. The brood is then stowed in either hollow tree trunks or in holes previously abandoned by badgers. The offspring remain with their mothers for the first four to five months of their lives and are sexually mature at between nine and twelve months of age. 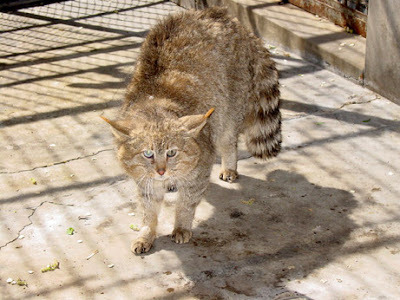 There is considerable disagreement amongst taxonomists on the subject, but Felis silvestris silvestris, or the Central European Wildcat, is thought to be merely one of ten recognized varieties of the European Wildcat. Of these subspecies, Felis silvestris cretensis of Crete and Felis silvestris reyi of Corsica are believed to be extinct. The other identified subspecies are Felis silvestris jordani of the Balearic Islands, Felis silvestris euxima of Rumania, Felis silvestris molisana of Italy, Felis silvestris morea of southern Greece, Felis silvestris tartesia of southern Spain, Felis silvestris caucasia of Turkey and the Caucasuses, and Felis silvestris grampia of Scotland. 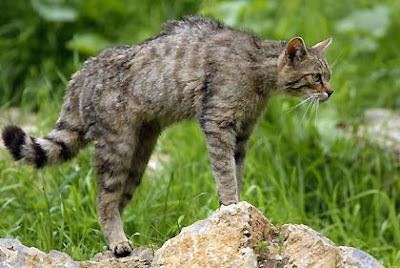 Regardless of their classification, European Wildcats are believed to have diverged from their cousins in the Middle East, Africa, China, and elsewhere about twenty-thousand years ago. Furthermore, they are distinct from Middle Eastern Wildcats (Felis silvestris lybica) from which all domestic cats are descended. Some interbreeding between domestic cats and wildcats, particularly in Scotland, has occurred, however. This method of preservation is fraught with insupportable difficulties, however. First of all, imprisoning wild animals in cages transforms them into de facto penal colony inmates and ultimately destroys them as well as the species. No one except a scientist would ever be so dishonest as to maintain that being a lifer at Sing Sing was comparable to being a free citizen. Blouin's study revealed that trout raised in hatcheries are not only less fit to survive but also less capable of reproducing once released back into the wild. If this is true for fish, it is likely applicable to other species as well. Above all, this research emphasizes the urgent need to protect wildlife habitats from the ravages of developers and climate change. This is not, however, the agenda that wildlife officials and the scientific community are pursuing. 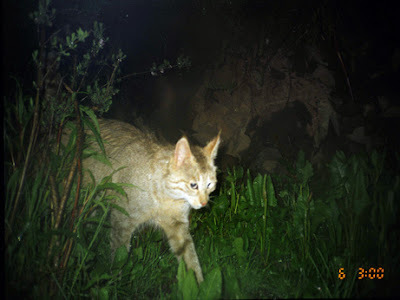 Even in Hainich, Moelich and BUND wasted two and one-half years trapping, tranquilizing, radio-collaring, and snooping on nine European Wildcats. DNA samples were no doubt also taken and the cats were more likely than not measured, weighed, and photographed as well. Contrary to the blatant falsehoods expounded by wildlife officials and members of the scientific community, RFID tagging of animals does not contribute one iota of knowledge that is beneficial to their conservation. Nor does it in any way protect them from motorists, hunters, developers, climate change, or a scarcity of food. Everybody on this planet knows that habitat preservation is the only means of saving the animals. Besides providing its practitioners with fat welfare checks and the opportunity to play God, tagging does absolutely nothing to advance this goal. Au contraire, it turns animals into research subjects, robs them of their freedom, privacy, and secrets, and even results in the deaths of many of them. Even those that are not killed initially often later succumb to the stress of repeated trappings, taggings, confinement, and deliberate eliminations mandated by whatever pogroms du jour that the scientists happen to have going. Photos: Deutschepresseagentur (European wildcat), Martin Steiger of Wikipedia (European Wildcat in Wildpark Peter und Paul, St. Gallen, Switzerland), and Der Spiegel (map). "Winning a World Series is a dream come true. This (Animal Rescue Foundation) is beyond the dream." Plagued by injuries to key players all season long, the St. Louis Cardinals gave it a good try but they faded down the stretch in September. They therefore did not make the playoffs and will not be able to defend the World Series title that they won last year. 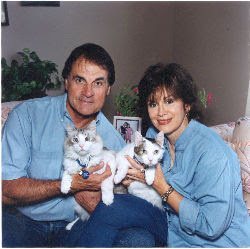 When it comes to saving the lives of homeless cats and dogs, however, manager Tony La Russa is a perennial winner. 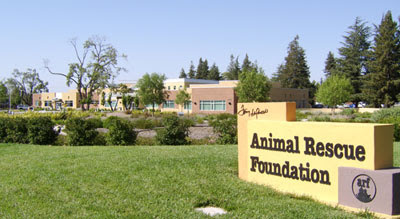 Most notably, since he and his wife, Elaine, established the Animal Rescue Foundation (ARF) in Walnut Creek, California back in 1991 they have found homes for more than three-thousand cats and dogs who otherwise would have been killed by either more conventional shelters or animal control officers. Their no-kill shelter, which occupies 37,700 square feet of space on six and one-half acres of land and is manned by sixty full-time employees and four-hundred volunteers, is considerably more than a cat and dog adoption agency. For instance, it also provides emergency medical and dental care, sterilizations, and canine training classes as well as distributing free pet food to the poor. ARF is also mindful of the special needs of both the young and old alike in Contra Costa County. For children, ARF offers classes on how to properly care for animals while individuals confined to nursing homes are paid regular visits by the shelter's cats and dogs. The goal of the organization's Visiting Animal Program is to lift the spirits of the elderly who are cruelly deprived of keeping cats and dogs because of where they live. "ARF saves dogs and cats who have run out of time at public shelters and brings people and animals together to enrich each other's lives. ARF strives to create a world where every lonely person has a companion animal, and where children learn to care," is how the animal rescue organization defines its mission on its web site. La Russa's involvement with animal rescue began, oddly enough, at his place of business, i.e., the baseball diamond. 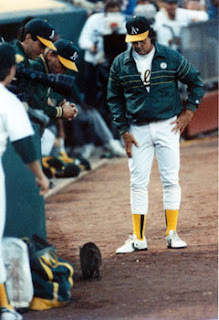 Back in May of 1990 when he was still with the Oakland Athletics, a terrified stray cat later named Evie ran onto the field during a game with the New York Yankees at the Oakland Coliseum. (See photo above.) La Russa was able to coax Evie into the A's dugout and was planning on turning her over to a shelter after the game. He soon found out to his chagrin that by doing so he would by signing Evie's death warrant because at that time there were not any no-kill shelters in Contra Costa County. He therefore changed his mind and was able on his own initiative to find a good home for her. Little Evie's impromptu sprint across the diamond was therefore the inspiration for everything that has transpired ever since. Totally dependent upon private funding, ARF relies upon donations and fundraisers for its survival. The organization is fortunate to be able to count amongst its supporters the celebrated guitarist Carlos Santana who has performed gratis in order to help it raise funds. Perhaps more importantly, La Russa's commitment is genuine. "Elaine and I have been really pro-active," he told the Oakland Tribune on February 15th of this year. (See "Professional Baseball Champ Also a Champion of Animals.") "We just don't lend our name. We spend a lot of hours volunteering. People see we're really committed." During La Russa's twelve years as skipper of the Red Birds, the team has made seven post-season appearances including last season's World Series victory over the Detroit Tigers. Now, the rumors are flying that he may bolt the Cardinals next season in order to take over the reins of the Seattle Mariners. It is not known what impact it will have on La Russa's future, but the team earlier this week fired General Manager Walt Jocketty. Regardless of whatever career path his life takes, La Russa's commitment to the cats and dogs of Walnut Creek is not likely to change. Cat and dog lovers will simply have to change their allegiance from the Cardinals to the Mariners should he ultimately decide to leave St. Louis. La Russa describes the juxtaposition between managing a baseball team and his work at ARF as the difference between doing something that is professional as opposed to personal. "There's no crystal ball for a baseball season, so that's professionally challenging. But this is personal. You're talking about life and death." La Russa, who also holds a Juris Doctor from Florida State University and is a member of the bar, sums up his feelings on his dual responsibilities by saying, "Winning a World Series is a dream come true. This (ARF) is beyond the dream." "If our only legacy is a dead planet, what does that say about us as a species?" "These pictures will call attention to one of the rarest and most beautiful small cats," the WCN's Jim Sanderson told National Geographic on August 30th. (See "Rare Chinese Cat Captured on Film.") "Until now even cat specialists had only seen this animal as skins or in less than perfect shape in zoos." Felis bieti are stocky cats that weigh between ten and twenty pounds and measure three to four feet in length. They have thick fur that is pale-gray in the winter and dark-brown in the summer. Their short tails are characterized by five or six dark rings with black tips while their ears have small tufts. These solitary animals live in burrows and are found in the provinces of Tibet, Qinghai, and Gansu as well as in Sichuan. Hunting primarily by night, they subsist upon a diet of pikas, voles, and pheasants. They breed once a year between January and March with between two and four kittens arriving in May. The offspring remain with their mothers for the first seven or eight months of their lives before striking out on their own. Their life expectancy is between ten and twelve years. Although the cats are believed to have been around for millions of years, a recent DNA analysis conducted by the National Cancer Institute in Frederick, Maryland concluded that they are one of five subspecies of Felis silvestris. If that is indeed the case, their scientific name will likely have to be changed to Felis silvestris bieti. Compounding matters further, nothing is being done to save the cats. "Pandas go for a million dollars a year to rent and are very well protected by Chinese law, but there is virtually no protection for this cat," Sanderson told National Geographic in the article cited supra. "There is no interest in its conservation because it's poorly known, but now perhaps this will change." While it is possible that WCN's photography work will elevate Felis bieti's profile amongst conservationists and Chinese officials, it is highly unlikely that this will lead to anything positive. 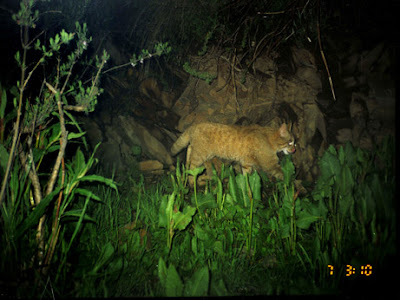 Au contraire, the WCN's next foray into the woods will probably involve the repeated trapping and radio-collaring of the cats so that it can turn them into research specimens. The magazine's support for the WCN's remote photography project is just another gambit in its all-out war against cats. Furthermore, even if it is serious about saving certain species it will only permit them to survive on terms that it dictates. Global warming is also a serious threat to the cats. With the Chinese economy roaring along at a growth rate of almost twelve per cent a year, greenhouse gas emissions will eventually destroy the cats' habitat and kill off the pikas as well. Temperatures above eighty degrees Fahrenheit are lethal for Ochotona pinceps and biologists fear that the species could become extinct before the end of this century if temperatures continue to rise. 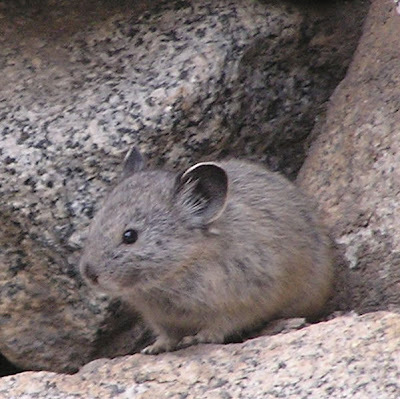 Already approximately one-third of the pikas in Nevada and Oregon have gone extinct. In addition to heat-related mortalities, global warming is, inter alia, shortening the time frame available for pikas to gather food, shrinking their habitat, disrupting the types of vegetation that they eat, and reducing the insulating snowpack. A similar impact can no doubt be expected on China's various species of pikas who are already listed as vulnerable by the IUCN. 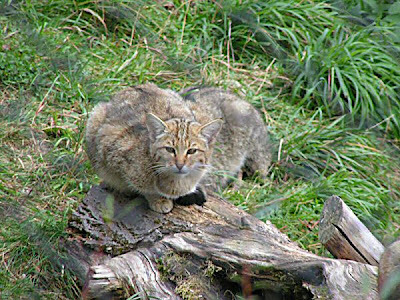 Instead of converting all of nature into an outdoor zoo where cameras, traps, radio collars, and guns allow wildlife proponents and the scientific community to control and abuse animals at will, all money and expertise should be directed toward stopping the slaughter of Chinese Mountain Cats for their fur and the poisoning of pikas. Moreover, unless the citizens of this planet get serious about curbing greenhouse gas emissions, development, and population growth all animals, man included, are doomed. Survival is certainly of paramount importance, but both man and the animals are entitled to their freedom and dignity as well. Unfortunately, these are the very rights that the scientific community and wildlife proponents are determined to usurp even as they preach the gospel of conservation. Photos: Jim Sanderson, Yin Yufeng, Drubgyal, and Aheu (Chinese Mountain Cats) and Justin Johnsen (sic) of Wikipedia (California pika).